In short it's strongly recommended to jump start and get some vision of the landscape of Unity development. 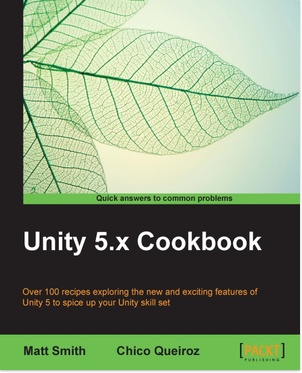 The book is organized as a cookbook as titled "Unity 5.x Cookbook" and it's the series of tutorial lessons actually. Some of lessons are easy and kind of artificial and they are used to show core concepts and lead to real useful tasks. I liked the tutorial of map radar for the shooter game. I made it and even submitted errata that was accepted. There are a lot of more useful lessons there. If You have time to learn it's very good addition to Unity tutorials and official Unity documentation. Unity Virtual Reality Projects [eBook] Jonathan Linowes and Building an FPS Game with Unity [eBook] John P. Doran are in queue to read, study and review.